I went to Franschhoek for the Bastille Festival. I found myself squashed, ripped off and very damp from the constant rain and the inability to get out of it. Bastille Festival was beyond dreadful and I will never be back again. But Bastille led me to the doors of Reuben’s in Franschhoek begging for a table and with great luck getting one! Reuben’s was absolutely gorgeous! A serious retreat from the hell that was Bastille. 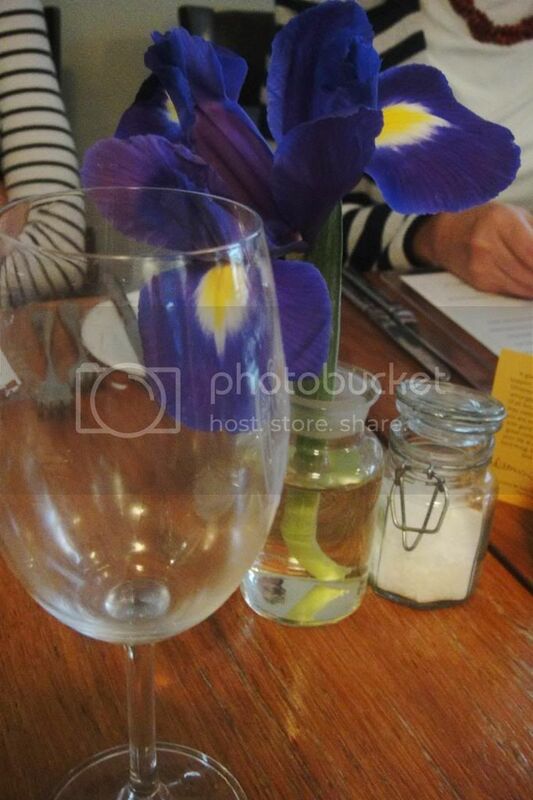 Reuben’s was all about gorgeous food, sublime dessert, craft beer, lovely wine and charming service. I will without a doubt be returning to Reuben’s on one of my many trips through the Franschhoek valley. 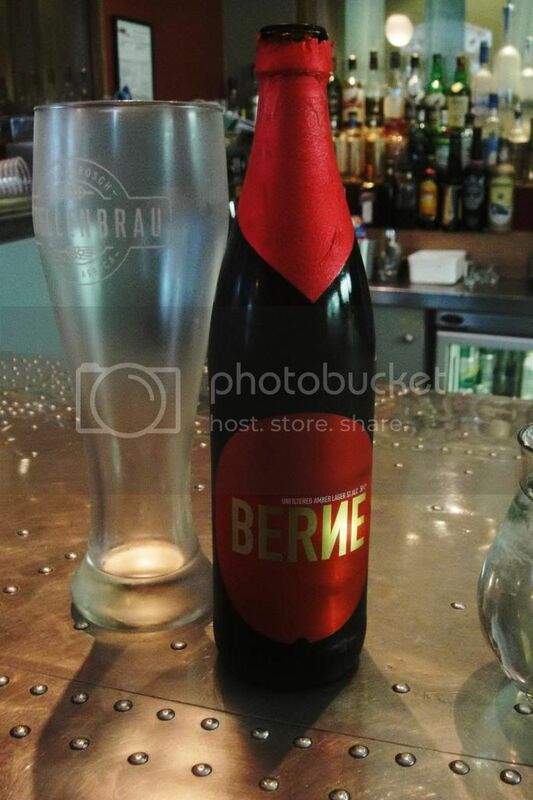 I was delighted to see the one and only beer I drink on the menu – &Union’s Berne! This beer is delicious and worth a try. Serious props to Reuben for stocking it. Franschhoek isn’t all about wine – they stock craft beer too! And without further ado on to the magic food! This here is the roasted cured pork belly with sesame greens, mushrooms (they are hiding in this picture), pomme puree, and chilli, lime and ginger caramel for R145 – and worth every cent. This dish was outstanding! We had a serious technical argument about whether this or the duck was the best. I haven’t got a definite answer but wow this was something. The pork was tender and juicey with a gorgeous crackled top. It was packed with flavour and worked wonderfully with the mushrooms and the pomme puree. And the pomme puree! Don’t even get me started! It tasted how I would imagine giant rain clouds would taste. The pomme puree was dense and smooth and rich and so delicious- they should just serve it on its own in a great big bowl with a spoon and a nob of butter! For those who are not following – pomme puree is like the serious French upgrade of mash potatoes. This is the duck we were having our technical debate over. This duck is outstanding, but so was the pork belly! 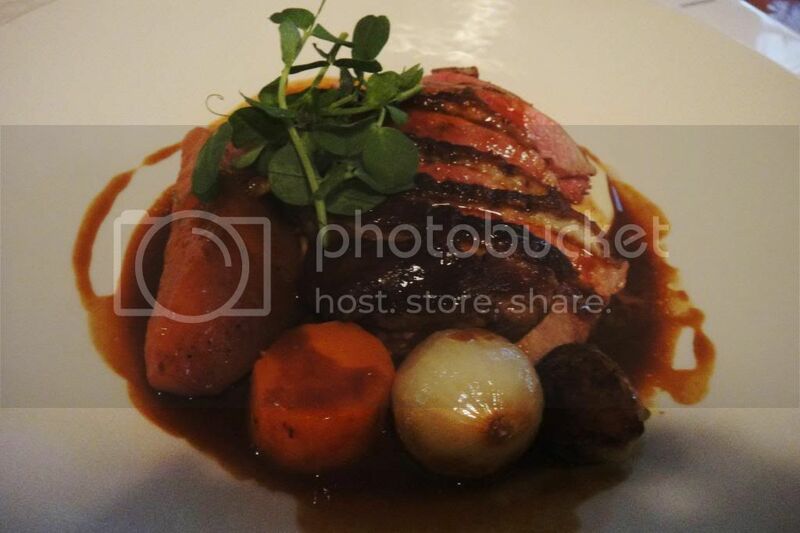 This is the five spiced honey glazed duck breast with pommes puree, poached quince and duck jus for R145. The duck was beautifully tender and full of flavour- clearly all 5 spices were necessary ;). Duck is easy to mess up- often being to dry or overcooked. This was a perfectly example of how duck should be cooked – very quickly at a high heat to maintain the rare red center a little like a perfectly cooked steak whilst still turning the fat golden and crispy. This is comfort food at its finest – its definitely the perfect lunch for a cold winters day with a fireplace near by. 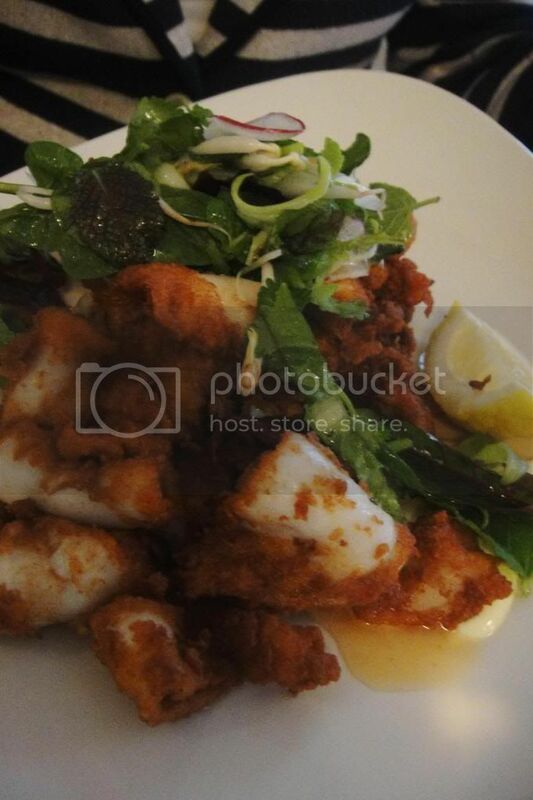 This is the chilli salted squid salad with fragrant salad, nuac cham and lime mayonnaise requested as a main course. It was very kind of them to adjust the dish. The salad was light and fresh. The chilli salted squid was full of flavour – and was certainly chilli flavoured! The calamari was light and tender – again something that can easily be turned into rubber bands! This was really delicious and filling whilst still being a lighter main course option. 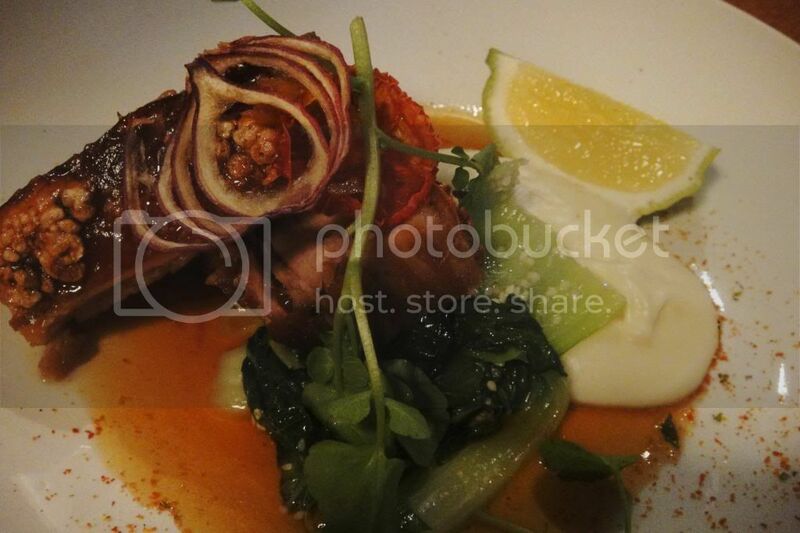 Overall the food was amazing and I was really impressed with the quality and freshness of all the ingredients. I’m looking forward to my next lunch out in Franschhoek. I couldn’t resist the dessert menu – it is a personal weakness of mine. But to combat this weakness I work on charming others into sharing dessert with me! This was a rookie error – because the dessert was delicious and I wanted it all to myself! Dessert was a French lemon tart with a mixed berry sorbet and passion fruit for R60. The tart was light and zesty and perfect with the sharp sweet passion fruit. And just look how beautiful the dessert was! The food is an absolute treat – for your eyes as well as your taste buds. Opening times: lunch from 12pm-3pm & dinner from 7pm til 9pm. The Kitchen at Maison Cosecha: For a Mexican Feast in Franschhoek First Thursday’s with La Petite Ferme in Franschhoek Tips on How to Spend a Weekend in Franschhoek!